Murphy Anderson was one of the seminal comic book storytellers who defined the Silver Age. In addition to his work on the Buck Rogers daily strip, he wrote and drew the Sunday version of the feature from 1958 to 1959 creating three continuities: “Search for Impervium”; “Supernova Threat”; and “California Earthquake Plot.” These Sundays have never been reprinted anywhere, and now, for the first time, are collected together in their entirety. The strip, which was created in tabloid form, will be reproduced in its full size, in full color, reconstructed to perfection. Anderson has long credited the strip as a major influence on his art and his runs on the feature have long been sought by collectors but never comprehensively collected together. 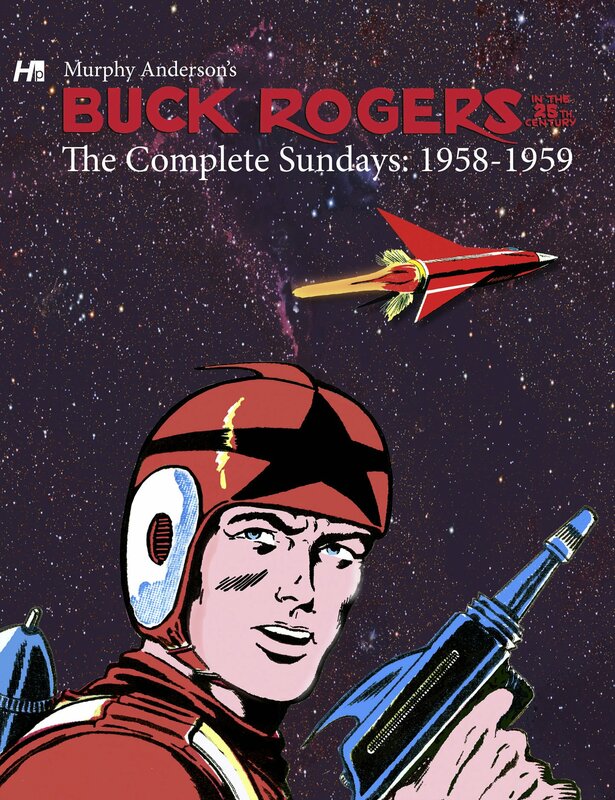 This extra large volume collects Anderson’s complete work on the Sundays and is supplemented by essays, original artwork, and tons of extras that makes this book the ultimate archival collection of Anderson’s work on science-fiction’s most important comic strip. For fans of Murphy Anderson this is a wonderful collection of never before reprinted work. Three story arcs, 49 Sunday strips in total, reprinted at original size. The art is clean and well defined, just as we know it from the science fiction books of the 1960s but missing some of the experience and polish. An excellent introduction by R.C. Harvey gives a decent look at Anderson’s career and a focus on the work presented in this volume. 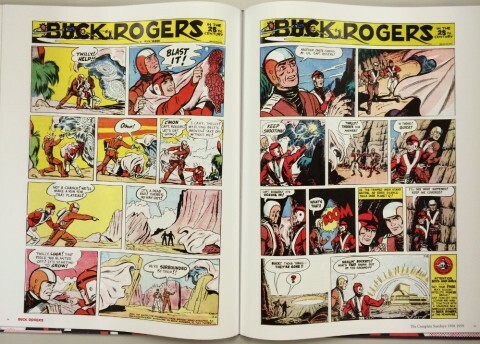 It includes a lot of DC original art, which is nice for fans but feels a little out of place in a Buck Rogers volume. At 18 pages it’s almost a quarter of the book. This is a thin slice of the then ongoing Sunday strip. We’re supposed to know the characters and their environment, which isn’t too difficult to discern. The stories are interesting with some political intrigue, spy shenanigans, blob-like aliens and science gone wrong. Classic science fiction writers Fritz Leiber and Judith Merrill penned the strips and it’s a very 1950s feel overall. 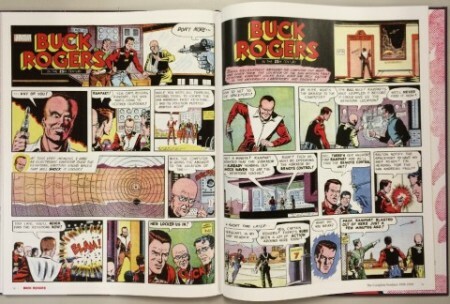 The first story arc is started by artist Rick Yager and completed by Anderson; he tries to complete the art in the former style and then evolves it over the next two arcs into his own. Solid construction with sewn binding, dust jacket and glossy paper. The pages are a bit thin but there’s no bleed through. Strips appear scanned from newsprint with minimal restoration; you can make out text bleed from the other side of the newsprint on a few of the strips. Text is mostly strong and legible, images clean and well presented. A few issues overall. At $40 for 49 strips this book is expensive. There’s a dust jacket of the book cover, an exact copy of what it’s covering, which feels like a waste of paper and additional cost. While I enjoyed the introduction it could have been substantially shorter without all the DC images: it felt like they knew the book was slim and needed to fill it out. Finally there’s something odd going on at Hermes. Their product page for this book shows “coming soon…” with a mock up cover but they have a page for it on their shopping site with the proper printed cover. Their Facebook page shows the book on May 16th and says it’s coming soon and order from Amazon. No mention anywhere that it was published and available for sale, and I couldn’t find any previews or images from the book’s interior. There are some disconnects there if the goal is to inform and sell to customers.